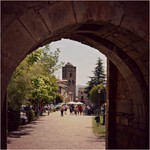 A bucket list of the top sights at Ainsa, ordered by popularity. Aínsa is the main town in the Aínsa-Sobrarbe municipal term, Aragon, Spain. It is located south of the Pyrenees, in a geologically interesting setting. Besides the surrounding mountain landscape, the 12th-century Iglesia parroquial de Santa María church and the 11th-century castle are the main sights of the town. It is believed that there is a connection between the Ainsa and the Anza family surnames.